China-Germany alliance has helped keep the glow on warriors' cheeks. Ma Lie reports from Xi'an. The earth in the ancient city of Xi'an continues to astound archaeologists. When excavation work to find more terracotta relics restarted for the third time last year in Xi'an, archaeologists admitted they did not expect to make any groundbreaking discoveries. Researchers suggested that the No 1 pit, the largest of the three that surround the tomb of China's first emperor Qin Shihuang (259-210 BC), was in a worse condition than the other two and not likely to offer rich pickings. However, the experts were more than happy to be proven wrong. Along with the more than 114 broken figures unearthed since digging resumed in June last year, the discovery of three "suitcases" made of a silk-like fabric has offered clues on the textile industry during the Qin Dynasty (221-206 BC). 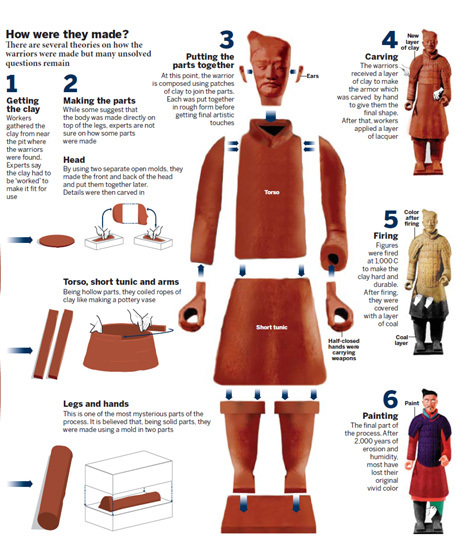 Arguably the starkest images to come from the dig, though, have been those of archaeologists dusting off the painted faces of newly discovered terracotta warriors. "It was a pleasant surprise," said Xu Weihong, who is leading the excavation of the 200-square-meter-site, at the Museum of the Terracotta Warriors and Horses of Qin Shihuang in Shaanxi province. "We found some painted in pink, red, white and lilac." The colors better highlight the expression on the figures' faces and could prove invaluable to the study of ancient China. And thanks to new technology developed in cooperation with a German institute, technicians on the scene were able to preserve the relics in their original painted colors - something that was unthinkable during the previous two digs. "When the excavation started, mold caused by moisture began to spread in the pits," said Wu Yongqi, director of the terracotta museum, which was officially opened on Oct 1, 1979. "When we wiped the mold off the surface dried out." As the relics were cleaned on-site, experts found that the exposed paint would curl and fall off due to water loss. 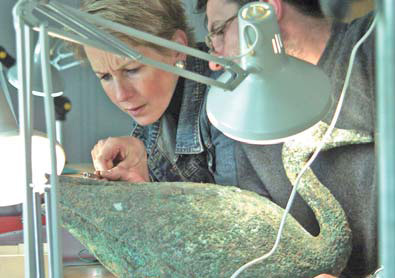 Enter experts from Germany's Bavarian Administration of Cultural Heritage and Rome-Germanic Central Museum Mainz, who in 1989 joined forces with Shaanxi to research and develop new techniques to better protect the province's bounty of relics.